I bought this about a year ago and it is one of my constant go to pieces...Absolutely stunning on the hand and puts some of my very fine diamond rings to shame. I wear this a lot and have not lost one stone and the setting doesn't have a mark on it. Definitely worth the money I paid. Comfortable and a real eye catcher. Brilliant sparkly and the most beautiful ring I own. A must have ring! I just received this ring today, and am awestruck of it's beauty and authenticity. I can wear it beside my 2K diamond and it looks just like a mined diamond. I will continue to buy these diamond aura pieces, and highly recommend them as a classy and beautiful accessory as well as a great investment. Where would we be without science? From Ptolemy's 2nd century geocentric model of the solar system to NASA's 10 year, 3 billion mile trip to Pluto, it is in mankind's nature to push boundaries and challenge what we know. Experiment. Test. Prove. It's the equation for progress. Once again science nails it. We owe this diamond-rivaling ring to science. Our Super Nova DiamondAura® Ring delivers all the fire of mined diamonds without the steep price tag. Using techniques pioneered by European atomic scientists in the 1970s, every DiamondAura is crafted using an incredibly complex and expensive process that involves heating rare minerals to temperatures of nearly 5000°F. The formula (and ingredients) behind every DiamondAura is designed to create the purest stone possible. Inferior formulations can result in milky or cloudy stones. Only the clearest, colorless crystals become DiamondAura. DiamondAura has all the classic jeweler specifications, including color, clarity, cut and carat weight. 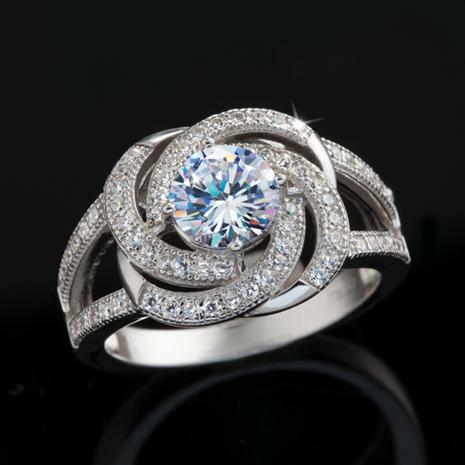 Perfecting DiamondAura has costs over $6 million and the spectacular results can be compared to a "D" flawless diamond. Named for the cosmic explosion that briefly outshines an entire galaxy, our Super Nova DiamondAura® Ring boasts a perfect round 1 carat sphere emitting a spiraling burst of DiamondAura set in luxurious .925 sterling silver. A stellar ring for a price that is truly out of this world.